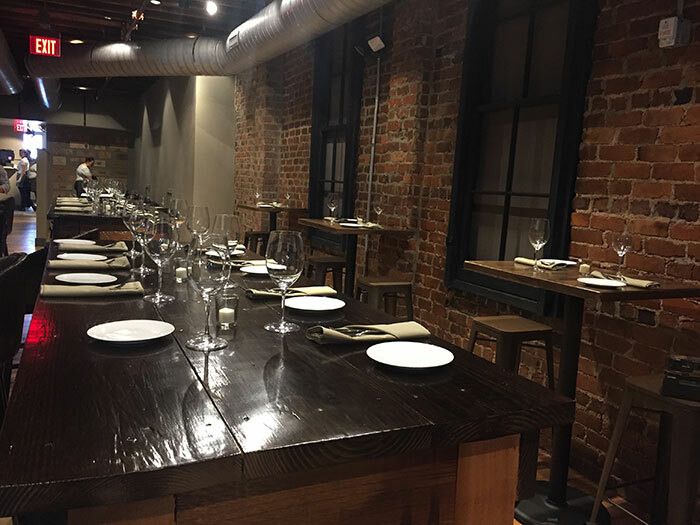 204 North, a farm-to-table restaurant that took over the empty space next to Ri Ra on North Tryon Street, is now open. 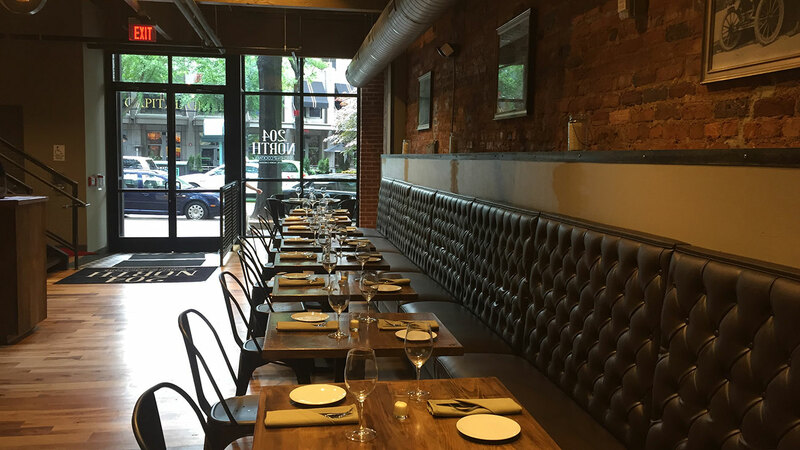 • Hours are 11 a.m. to 2 a.m. seven days a week with a full menu until 1 a.m.
We sampled the menu as a team and it made the waiting worth it. Order these when you go. 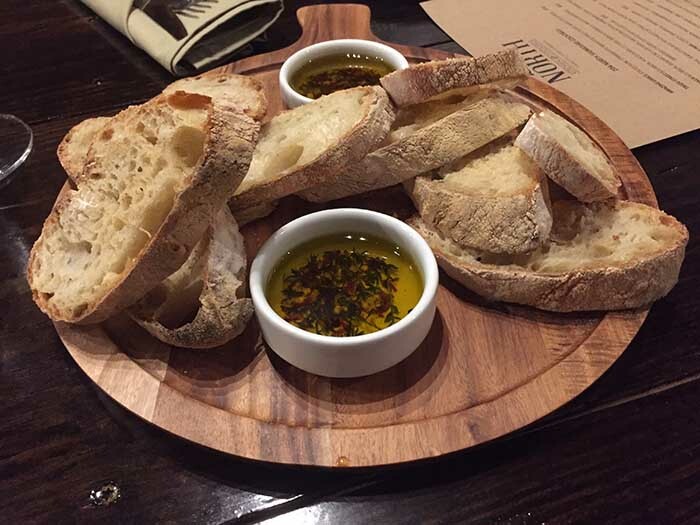 Ciabatta Bread – This is made in-house with ridiculous attention to detail (seriously, if you ask, you’ll find out about the fermentation period). 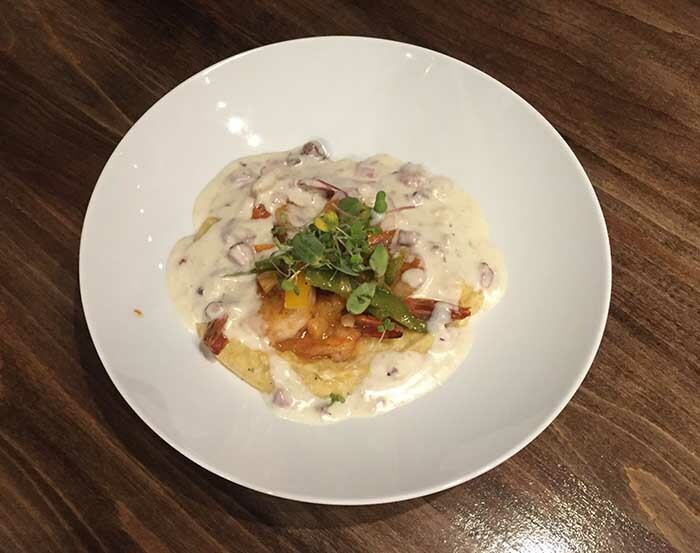 Shrimp & Grits – North Carolina shrimp sautéed with peppers, grits from a Concord farm and tasso gravy. Rich, creamy and a total runaway hit. 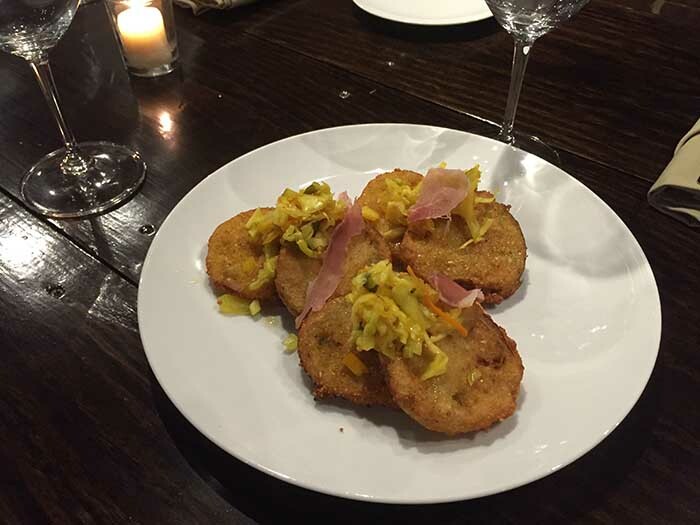 Fried Green Tomatoes – Green tomatoes breaded in flour, egg wash cornmeal and salt and pepper and then topped with Chow Chow and layered on top of pimiento cheese. It’s an incredible use of pimiento cheese – save some of this and put it on your leftover ciabatta bread. 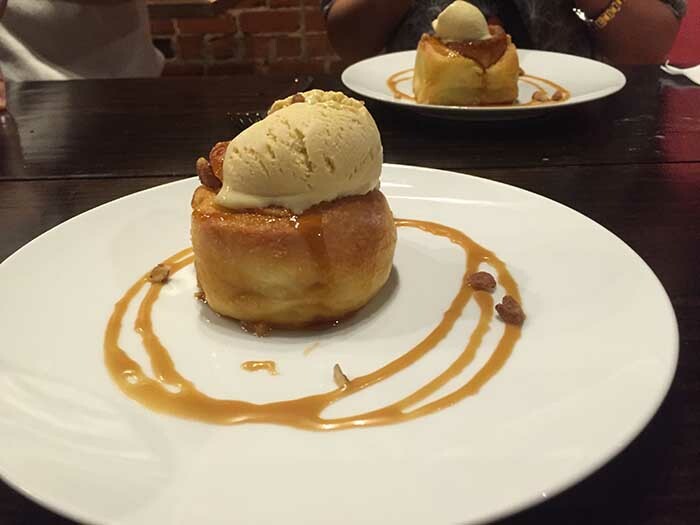 Sticky Bun – Exactly what you’re thinking, topped with a rye bourbon ice cream. Doughy, sweet and rich without being too rich. We devoured this. 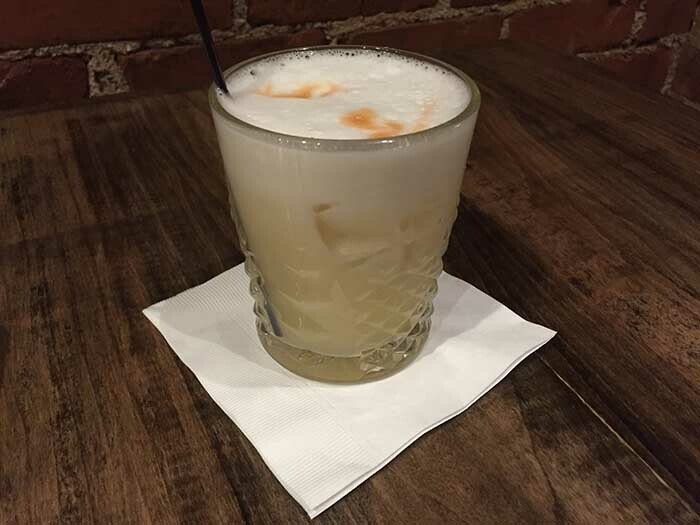 The Lake Wylie – Bourbon, lemon, simple syrup and egg white topped with club soda and dashed with Angostura Bitters. You’d never guess it was a bourbon cocktail just by looking at it, but you would guess it’s the perfect summer drink. 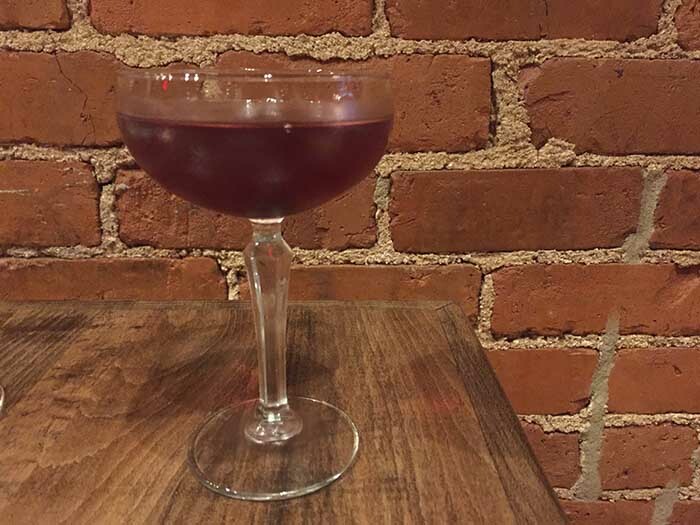 The 4th Ward – Tequila, 10 Year Tawney Port, lime juice, ginger beer and a dash of Angostura Bitters. Tart and lightly sweet, it drinks a lot like a soda. In a word, dangerous. 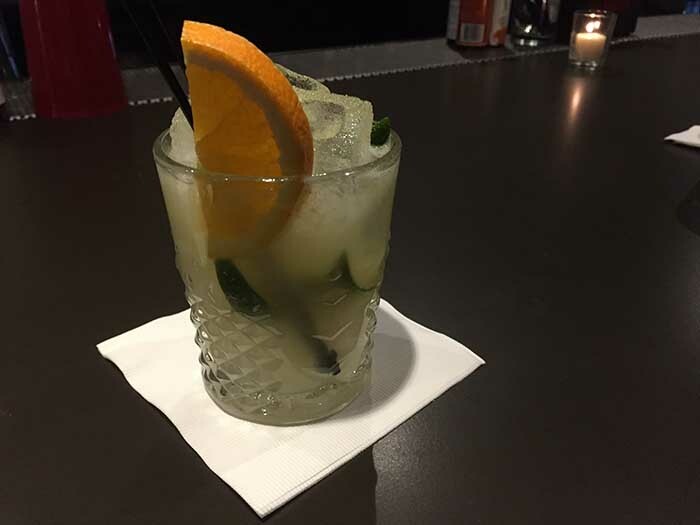 The Plaza Midwood – Cachaca, lime and orange muddled with local honey. 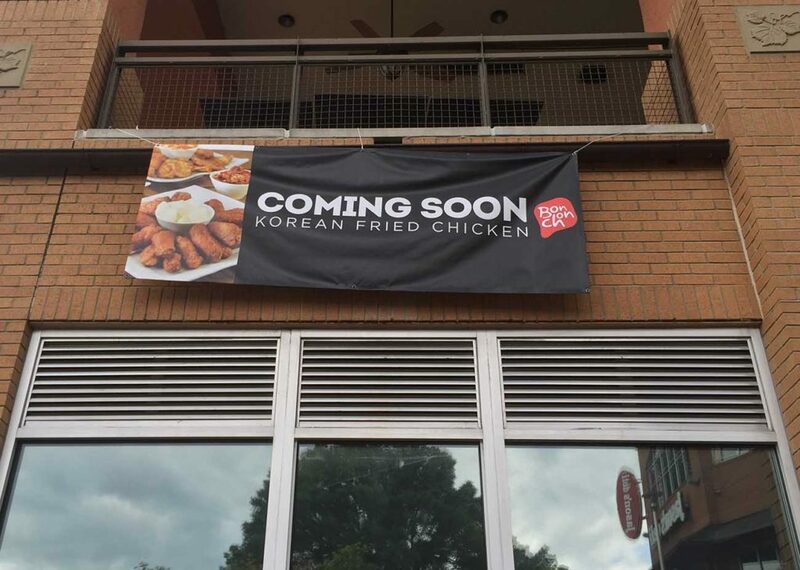 I was impressed and surprised – bitter and sweet at the same time. 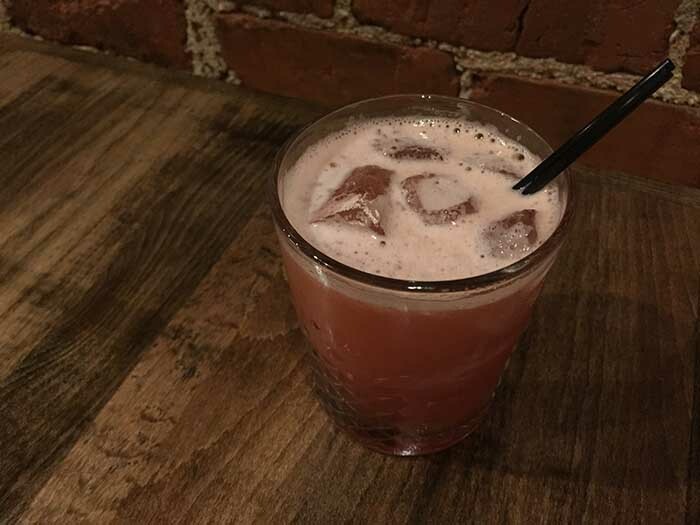 The Ballantyne – Gin, St. Germain, muddled strawberries and fresh mint, or, as it was often referred to, the White Girl Special. 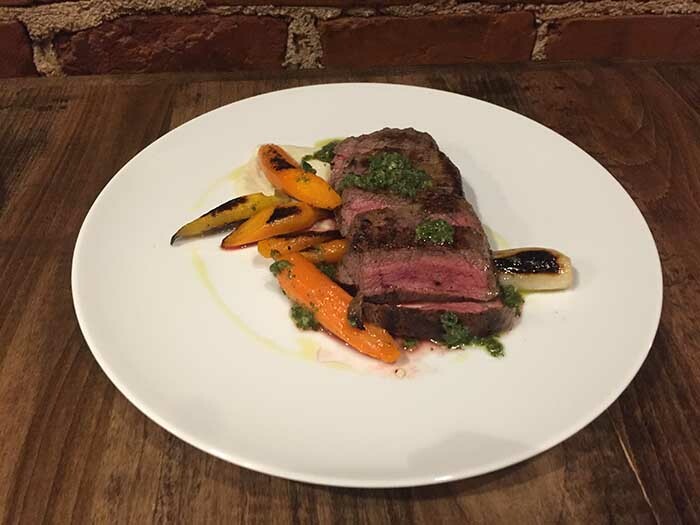 Flat Iron Steak – Pan-seared 7-ounce flat iron steak with onions, carrots and chimmichurri sauce. 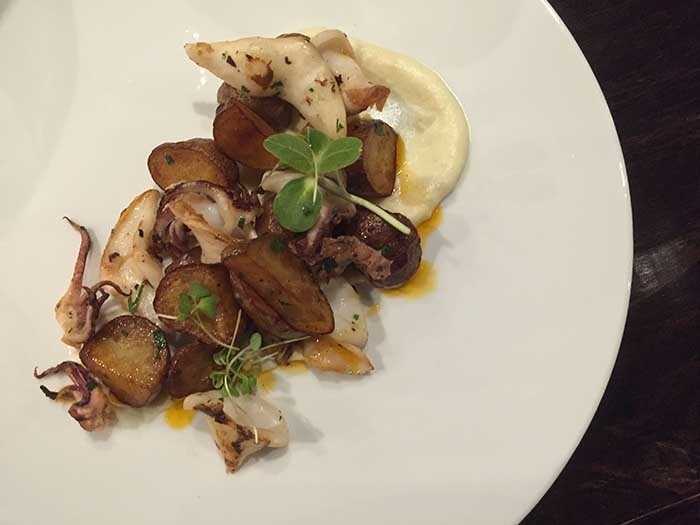 Calamari a la Plancha – Squid tentacles and olive oil-covered potatoes cooked on an 800-degree thick slab of steel. 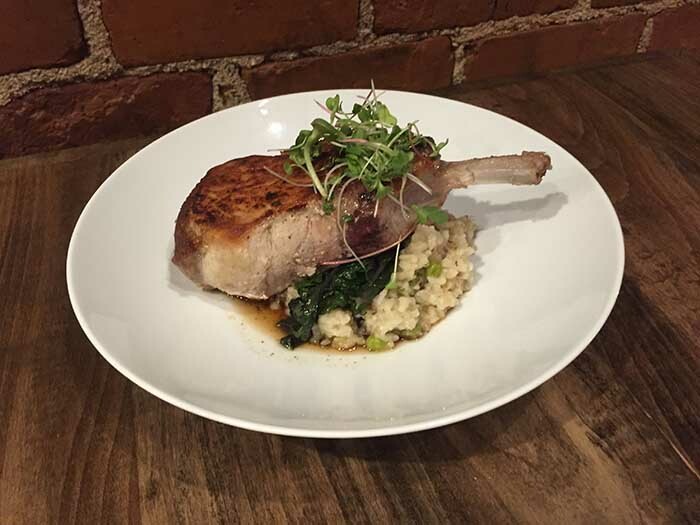 Pork Chop – A Heritage-breed pork chop on top of Hoppin’ John, a rice and peas dish made with onion, bacon and salt. Topped with wilted greens and soaked in a coffee and bacon jus. N.C. Trout – Trout cooked on the plancha in a braising liquid called “pot licker” and placed on top of peas with stock, thyme and olive oil. 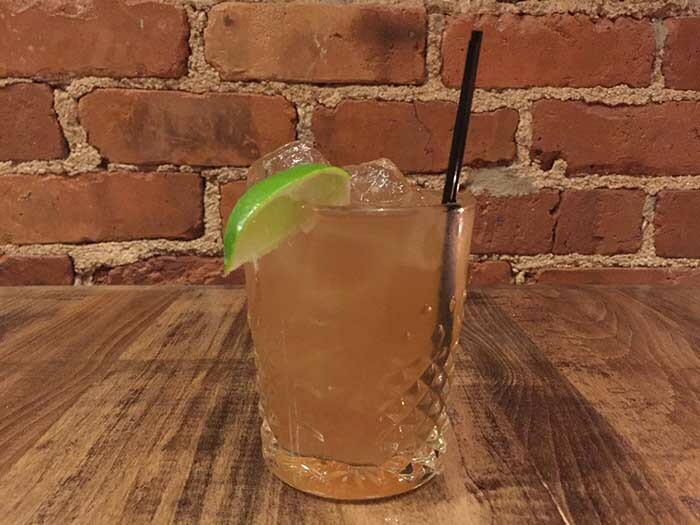 The Cotswold – Spiced rum, lime juice, simple syrup and ginger beer. 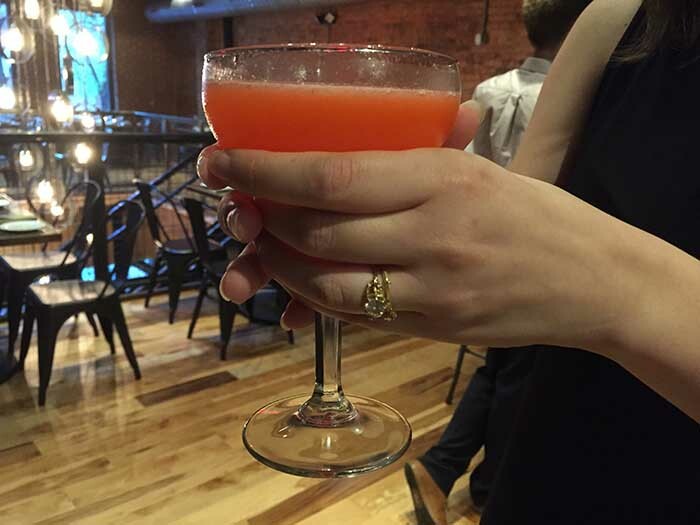 The Myers Park – Scotch, Drambuie, brandied cherry. The Trade Street – Bourbon, Fonseca Bin 27 Port, Antica Formula and Angostura Bitters. 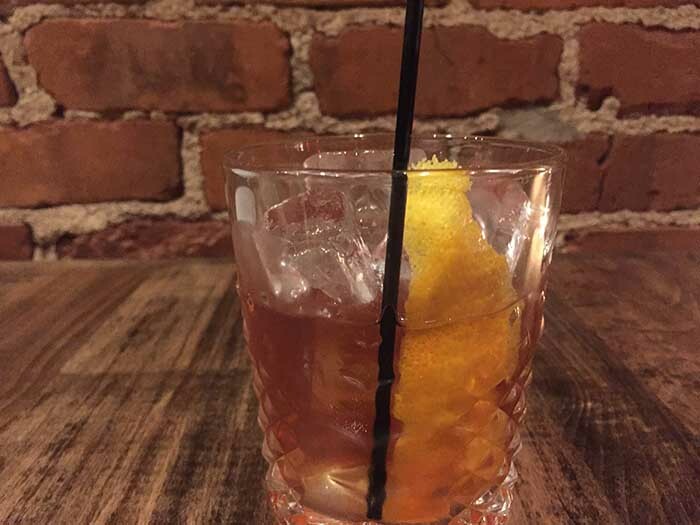 The Banker – Bourbon, Reagan’s No. 6 Bitters, Angostura Bitters, Demerara Sugar, orange wheel and brandied cherry, topped with club soda.